Home / What is Stack First Packing Algorithm? Once your customer has placed an order, the next crucial stage is packing those items into required boxes. With our Stamps.com Shipping Plugin with USPS Postage for WooCommerce, you can pack items individually, pack based on product weight and dimension, or pack based on total product weight. Why Stack First Packing Algorithm? Under Weight and dimension parcel packing method, we come across two packing algorithms namely, Volume-Based Box Packing and Stack First Packing. 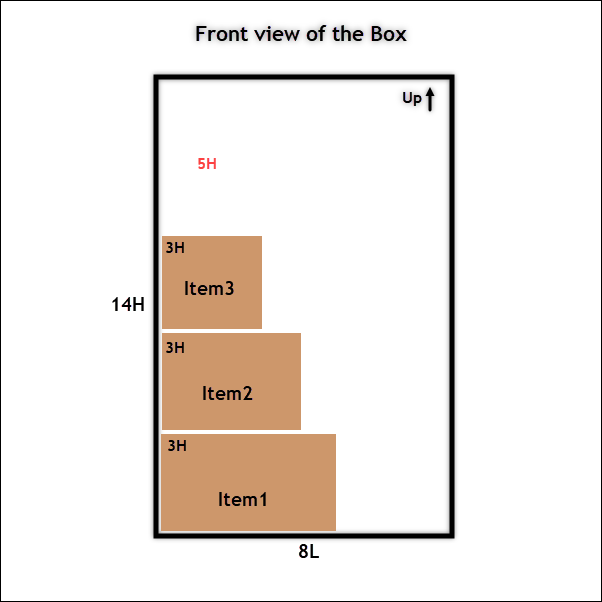 While the volume-based algorithm tries to fit the item in the box based on total volume of both item and the box, there may be instances when this option may not be feasible. 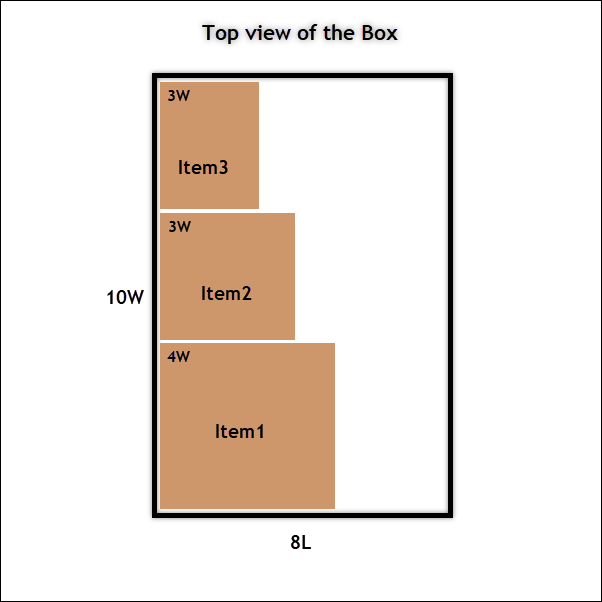 Like, when the remaining volume of the box may be larger than an item to accommodate, but practically, due to the varied shape of the item, it may not fit into the box. In these scenarios, you can opt for stack first packing algorithm. By definition, in Stack First Packing Algorithm, items are stacked or piled unto one another, based on either length, width or height of items as well as the box they are packed into. When this option is selected, a box dimension table is enabled, wherein you can choose boxes from Stamps.com service, or add custom box sizes of your own. 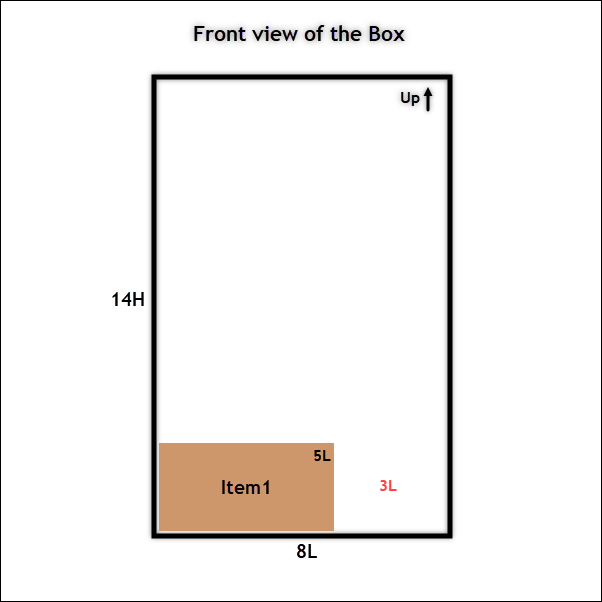 In this packing algorithm, the dimension of the item is compared with the box dimension. Suppose, if the length is taken into account, the length of the item is compared with the length of the box. If the length of the former is less, the item is placed in the box. Remaining items are stacked/added in the same way, side by side. Traditionally, a box has three faces. The dimension of the items is compared with the length, width, and height of each face of the box respectively. This comparison is done for all the available boxes that you have chosen in the Box Dimension table. Finally, when no further items can be stacked, the remaining volume is calculated. The box which has the least remaining space while fitting maximum items is selected for packing the items. If you are still unclear, let us understand this algorithm with the help of an example. Consider we have three items – Item1(5L x 4W x 3H), Item2(4L x 3W x 3H), Item3(3L x 3W x 3H) that need to be packed in a box. The length of Item1(5in) is compared with the length of the box(14in). Since the former is lesser in size, the item is placed in the box and the remaining length is calculated, which in this case is 9in(14in-5in). In the same way, Item2(4in) and Item3(3in) can also be placed, since their length fits in the remaining length of the box. Now the remaining space is 2in. If there is an additional item of length more than 2in, it’ll not be added to the present box, rather it is packed into other box or packed individually. The width of Item1(4in) is compared with the width of the box(8in). Since the former is lesser, the item is placed in the box and the remaining width is calculated, which is 4in(8in-4in). 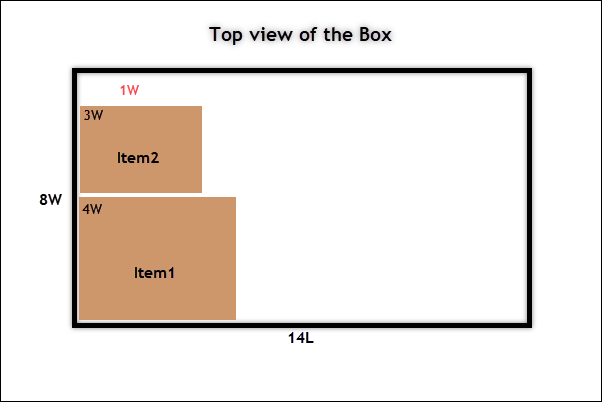 Next, the width of Item2(3in) is compared with the remaining width of the box(4in). Since there’s space available, the item is placed in the box. The width of Item3 is then compared with the remaining width(1in). Since there is no space for Item3, it will be packed in a different box, or packed individually. Hence, in this case, only two items can be packed. 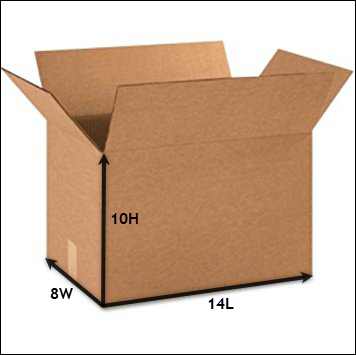 Similar to length and width, the height of Item1(3in) is compared with the height of the box(10in). Since the height of the item is lesser, it is placed in the box and the remaining height is calculated, which is 7in(10in-3in). 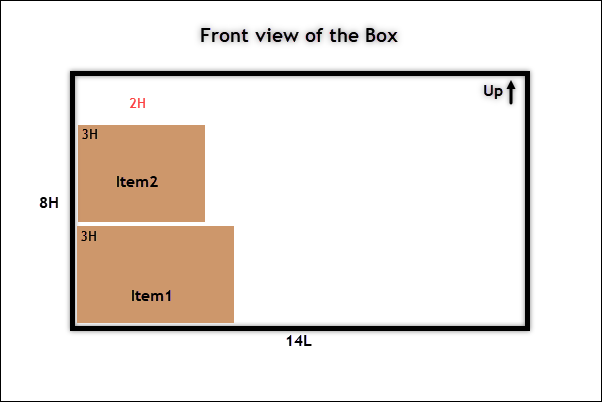 Next, the height of Item2(3in) is compared with the remaining height of the box(7in). Since there’s space available, the item is placed in the box. Likewise, Item3(3in) is placed in the remaining space(4in). When we change the face of the box discussed in the previous step, by moving the top and bottom section of the box to sideways (front and back), we get a box of dimension 14L x 10W x 8H, as shown in the image below. The length of Item1(5in) is compared with the length of the box(14in). Since the length of the box is lesser, the item is placed in the box and the remaining length is calculated, which in this case is 9in. The width of Item1(4in) is compared with the width of the box(10in). Since the former is lesser, the item is placed in the box and the remaining width is calculated, which is 6in. In the same way, Item2(3in) and Item3(3in) can also be placed, since their length fits in the remaining length of the box. The box has now reached its limit and there is no remaining space left for other items. The height of Item1(3in) is compared with the height of the box(8in). 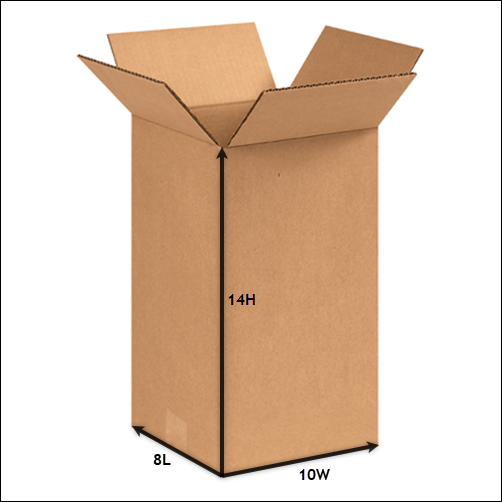 Since the height of the item is lesser, it is placed in the box and the remaining height is calculated, which is 5in. 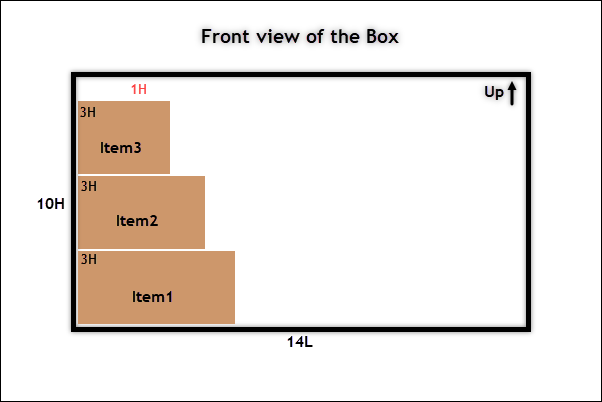 Next, the height of Item2(3in) is compared with the remaining height of the box(5in). Since there’s space available, the item is placed in the box. Likewise, Item3(3in) is compared with remaining space(2in). Since it cannot fit in, the item is packed in a different box or packed individually. Let us change the face of the box by moving the left side of the box to the top, as depicted in the image below. The length of Item1(5in) is compared with the length of the box(8in). 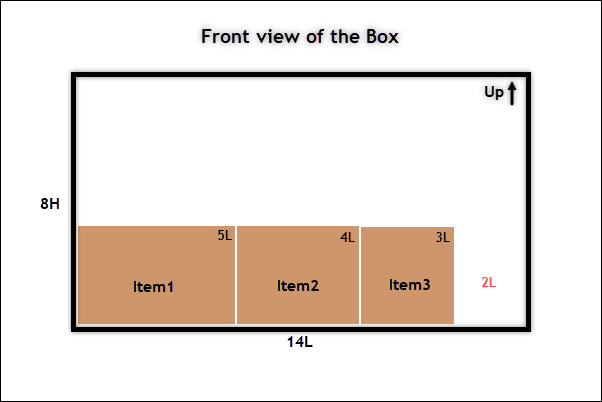 Since the length of the box is lesser, the item is placed in the box and the remaining length is calculated, which is 3in. 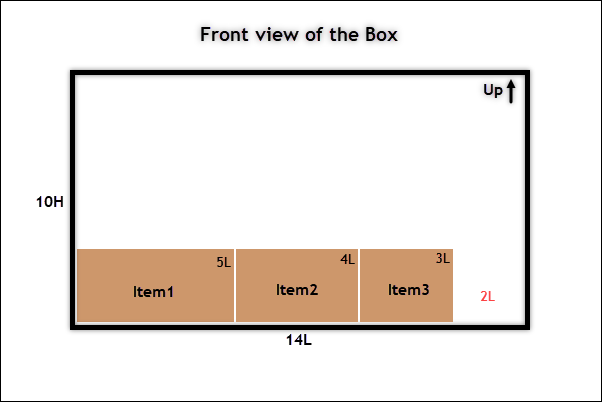 Next, the length of Item2(4in) is compared with the remaining length of the box(3in). Since the item cannot fit, it is packed in a different box or packed individually. The width of Item1(4in) is compared with the width of the box(10in). The item is placed in the box and the remaining width is calculated, which is 6in. 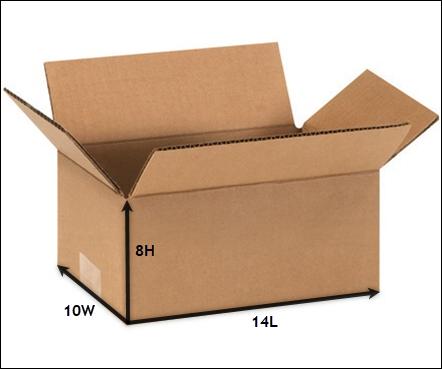 Similar to length and width, the height of Item1(3in) is compared with the height of the box(14in). Since the height of the item is lesser, it is placed in the box and the remaining height is calculated, which is 11in. 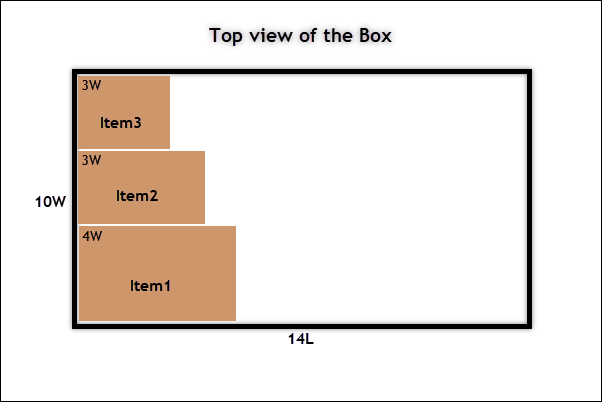 Next, the height of Item2(3in) is compared with the remaining height of the box(11in). Since there’s space available, the item is placed in the box. Likewise, Item3(3in) is placed in the remaining space(8in). For all the nine cases we have discussed in this article, the remaining volume of the box is calculated. The process is computed for all the available box sizes that you have selected in Box Dimension table in the Stamps.com plugin settings. To sum up, the box(and use-case) which can accumulate maximum items with the least remaining space is selected by the plugin for packaging the items. If the remaining space is very large, say more than 40% of the entire volume of the box, then the stack first packing algorithm may not be feasible, and the plugin automatically fallbacks to Volume-Based Box Packing algorithm. To explore more details about the plugins, go check out ELEX Stamps.com Shipping Plugin with USPS Postage for WooCommerce.